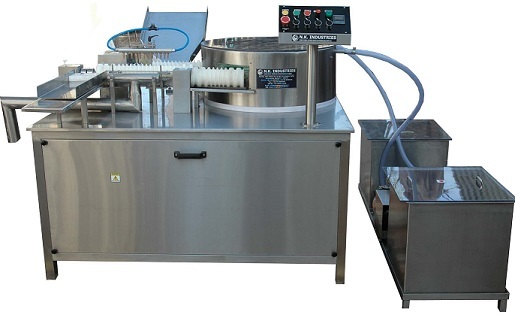 The Automatic High Speed Rotary External Ampoule Washing Machine Is Designed To Wash External Surface Of Ampoule, With 4 Stage Of Washing Which Include Washing Medium Like Detergent Water, Tap Water, Air Wash & Heating. The Speed Of The Machine Is Up To 250 Ampoule Per Minute And Can Be Varied Through Provided Speed Variation Port On Operating Panel. 3 no of heaters and each rating 1 KW. Note: in 1st and 2nd wash , Recirculation facility is available.